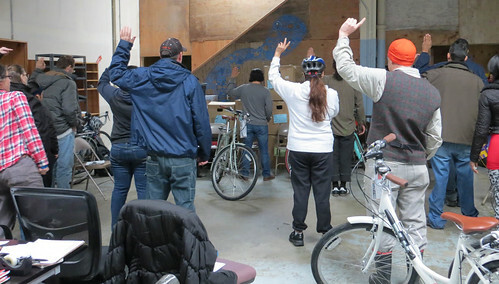 On Valentine’s Day, five women and five men from Central City Concern earned new commuter bikes equipped with everything they need to ride safely and confidently. This valentine joy also came with lessons on riding safely, taking bikes on transit, and locking the bike securely. All ten participants spent the day of this Create a Commuter workshop getting acquainted with their new loves. Create a Commuter workshops occur throughout the year in partnership with select employment agencies. The first program of its kind in the nation, Create a Commuter provides adults living on low incomes who are enrolled in comprehensive workforce development programs with a commuter bike. 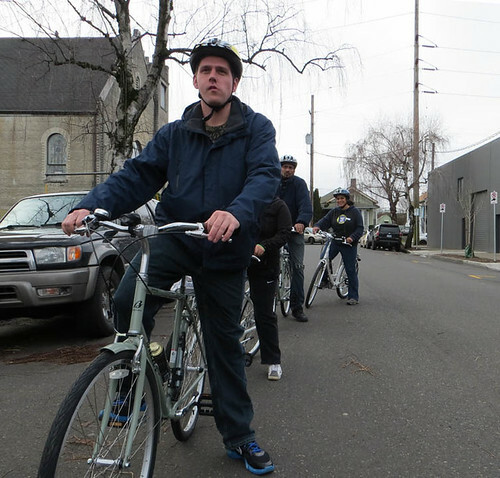 This program offers participants a flexible solution to meet their transportation needs, reduces barriers to work and bicycling, and promotes healthy activity. “Yes,” said Ryan, one of the Community Cycling Center’s Create a Commuter instructors. All this before the workshop officially started. Once things got going, participants said they wanted to ride to work, for exercise, to save money, for recreation, and more. Before getting their bikes, everyone picked out a helmet and learned how to wear it properly. Then came the big moment, getting matched with their new bikes! Everyone had a unique expression of happiness, from curious to jumping for joy. Community Cycling Center instructors went through basic bicycle anatomy, rules of the road, hand signals, and practice for riding transit with their bikes. After lunch, participants tested their skills during a ride. Everyone coasted down a serpentine ramp to a place where they could practice locking their bikes. What is fun if not riding a bike down a windy trail? Seriously. The bicycles and accessories that these new Valentine’s Day commuters received are purchased with funds from a TriMet-administered federal grant. Community Cycling Center volunteers assemble the bicycles and support staff teachers throughout the day-long training. Employment agency partners work with adults living on low incomes to identify eligible Create a Commuter candidates. Each plays a vital role in the delight brought to these and other Create a Commuter participants. Thank you! Interested in sharing the love of biking through the Community Cycling Center volunteer program? Click here to learn about ways you can get involved. And, for more photos from this sweet day and program, click here.